clave-rhythm or it is assumed. Clave for Dancers Workshop is a permanent tab (or page) on my tango blog. As a tab or page, it will change and grow. This is a workshop and not just a post or easy article. It may take a few sessions to get through it, and maybe a few reviews. I guarantee, however, that understanding the clave will transform your tango, salsa or whatever dance you love. Eventually, I will have video examples that I will perform on percussion instruments because I cannot find video examples that are good for dancers. Also, I will add some great musicians playing these essential rhythms. Please come back and also tell me what you find confusing, so that I can better this page. It is possible to make an anonymous comment at the bottom of the page, or you can email me at mark.word1@gmail.com. Purpose: This page was started as a help for salsa dancers in my local area (see the ¡KMC Salsa! tab). But in reality it will be helpful to a wide range of dancers who love a wide range of Latin American dances which have roots from the essential rhythmical structures of Africa, such as salsa and tango. Latin American dances have a special feel to them that makes us want to get up and dance. Clave for Dancers Workship will also address what the essential rhythm (clave) is of tango, since it appears to be so unknown or even denied by tango musicians and teachers. I have avoided the subject because of the controversy, but now the cat is out of the bag: Tango has a clave rhythm (essential rhythm) that is explicit or latent but never goes away, which is no different than Mambo or Merengue or Son. ||: 1*3*5*7* | 1*3*5*7* :|| Each number is a foot tap and a * is a silent beat. Try tapping and counting all 8 beats to the above and you will see what I mean. The funny symbols ||: and :|| mean just to keep repeating everything written between them, which is truly what the musical symbols for "repeat" look like. The word "clave" is Spanish. It can mean several things, but here it means "essential rhythm that comes from Africa." The concept of essential is that the rhythm does not simple go very well with a particular music, but just the opposite -- the music fits into the rhythm, thereby making this rhythm essential. This concept is also true of the waltz. Believe me, this essential rhythm is not really that radical. The waltz, for example, is not a waltz if it strays from a defined rhythm in three. Although the clave has it's origins in Africa, the term is Spanish. The name probably comes from wooden dowels (claves de madera) from crates on which slaves would pound out these essential rhythms for dancers and hand drummers, congueros. ||: 1**4**7*/**3*5*** :|| Called 3/2 clave because of 3 beats, followed by 2 beats. ||: **3*5***|1**4**7* :|| Called 2/3 clave, reversed from the "normal" clave. This essential rhythm is played or assumed. Since tango usually does not have drums, the tango clave is also nearly always assumed. At times tango tap out the tango clave on the sides of their instruments. Most clave rhythms are in two parts, and the composer tells the musicians at the top of the music on which part the clave will start (3/2 or 2/3). Chachachá and tango are fixed, but tango has an alternative upbeat clave that some of the best composers preferred during the Golden Age of tango. This essential syncopated beat, the clave, is mostly not played these days on the sticks, called claves (pictured at the top of the page), but traditionally bands had more percussionists and the claves were often played by a single percussionist. I saw a group of African drummers playing in Paris, and they had a single percussionist playing on two tonal pieces of wood. He played the exact rhythms that most Salsa/Mambo timbale players play! I was amazed. The clave was continually played by the Africans, but in Salsa today, the clave is only at times played by the Timbalero or perhaps a horn player or singer who will play it out by clapping or playing it on anything, including sticks (claves). Although the clave rhythm is no longer so often played explicitly, nearly all the musicians know exactly where it is because it influences all melodies, horn lines, and rhythm instruments. Very much like clapping the two and four beats in rock 'n roll, the clave's syncopated "pulse" never goes away in the person's mind who understands this music beyond the surface. Here is an example of a composer's notation of a Mambo. He writes, "2-3 clave" at the top left side, telling the musicians what the essential rhythm is and which of two possibilities of clave they must follow. Just because a person likes salsa, chachachá, merengue, or tango, does not mean that he or she will be cognizant of the clave rhythm. This apparently is the problem with tango: Many people love tango, do not hear the clave, and then deny that it exists! However, if you are open to this journey, eventually it will open up the heart of Latin American music. This heart is African. If you hear a pulse to the music, this is a different heart. That pulsing-like-a-clock heart is European. The African heart is different. It is a syncopated heart, and it is the African epicenter of most Latin American music. Musicologists have even found the regions from which different claves had their origins. The Son Montuno Clave, which I wrote out above, came from refugee Haitian slaves, who had escaped to Cuba after the French were expelled. Don't get in a fight with a Cuban over this, but in reality Haitians, musically trained by French colonists, created what is now called "Afro-Cuban music." You may also hear someone say that clave did not come from the Spanish name for nail or wooden dowel. 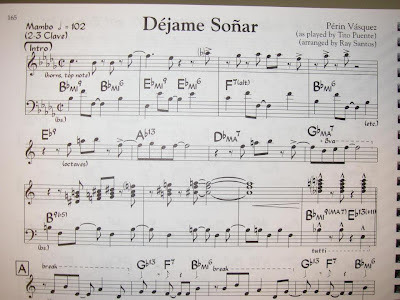 The Spanish word clave is also the name for "key" to a map (but not to the door), or "cornerstone" / "keystone"; so some believe that clave is referring to the "key" to the music. Clave can even mean "password" in Spanish. The clave is the key to the music and the password to the music, but that is just an interesting linguist twist, although believed by some scholars. Wikipedia's clave article denies the origins of the wooden dowel, believing in the "keystone" or "key to the map" etymology. I suggest that you go to a music store in Cuba and ask for claves, someone will bring you two sticks on which one can pound out rhythms, not two maps maps, a few big rocks, or the password to a computer. Remember the Haitians who escaped to Cuba spoke Spanish as a second language, and worked around dowels. They sang, danced and played out these rhythms at the docks on sticks and wooden crates for drums. Not only Cubans might not like this page. Argentina has its own pride about it's musical heritage connected to Europe. Up until now, I have only seen blank faces or outright denials that tango has a clave. But surely I cannot be the only one that feel this! Please join me. You will too! So now we have seen the most famous of clave (above). Here are some more musical examples of the clave, using the musical notation for dancers that I introduced above. The Rumba clave may be harder for you to feel. It is more complex, but once you have it, you will love it! The Rumba clave, which for example is used for Songo, much of Latin Jazz, Guaguacó, and many others also can be 3/2 or 2-3. Soon, I will find some nice examples of this clave. The following is a poor musical example of the clave because it is hard to hear. So much is going on rhythmically. However, I will demonstrate this in the future with my own video. For now this gives you the dance, which indeed is a partner dance (of a kind) which ends in the vacuna ("vaccination") of the female. I let you figure out the poetic meaning of vacuna. The chachachá, never changes from this. That is why dancers should start on the start of the clave! Informed dance instructors say "start on two," but many students never get it because of teachers who do not explain the clave or cha-cha-chá that the conga player and the dancers "play" together. The majority of Latinos in El Paso started on the downbeat, and as a result, their feet did not follow the clave nor the conguero. If you did not grow up with Chachachá, chances are that you must learn to hear this distinct clave. The following video is from Cuba, the birthplace of this music. Although this video clip is not ideal because it is choreographed, they really embody the feel of the dance. Please notice how the forward or back movements are always on 2 and the "cha-cha-cha" of their feet goes to the music. Along with the firmly set Chachachá clave (2/3) is the Tango clave, that is set because it is only a repeat of the "trecillo" which is the group of three beats that we have seen so far, which are connected to a measure of two played notes. Notice that both start out the same with the group of three notes. In the video clip below, the tango musicians will explain the clave as a sincopat (syncopation), but in reality it is the typical tango clave. The other elements may hide this clave somewhat, but it there. Not having connection to northern music, like samba (Brazil), cumbia (Columbia), merengue (la República Dominicana), mambo (Cuba), salsa (NYC), these musicians have their own words, but they are all connected to the concept of the African clave rhythms. There is no use getting into a discussion with tango teachers and musicians. You would think they know, but apparently they most do not. However, you may have a better chance talking with musicians from Uruguay, who seem to be more in touch with their rich African heritage. I should explain why the musician says 3+3+2 (which of course equals eight). I will give you my notation again and put the 3/3/2 notation under it. They are the same rhythm of tango's clave. ||: 1**4**7* | 1**4**7* :|| = tango dancers dancing on the rhythm (1/4/7). ||: 123 123 12 | 123 123 12 :|| = tango musicians thinking about the rhythm (3/3/2). The milonga rhythm (called "tangó" rhythm in Cuba) is believed to be different than tango, but it is truly the same beat with a note added. The added note makes milonga very nice for the dancers because is 5 which is also a pulse beat (country western notation will demonstrated that below the milonga notation). ||: 1**45*7* | 1**45*7* :|| Milonga (one and five are pulse beats). ||: 1*3*5*7* | 1*3*5*7* :|| Country Western (one and five are pulse beats). Dancers -- even advanced dancers -- tend to dance on the pulse, totally unaware that they could dance on the clave. Even when it is pointed out by the the musicians, notice that not one tanguero soul dances to the "change" in the music. Okay, dancers, here is a milonga with Leandro and Andrea (dedicated to Andrea Misse, tragically killed in a car accident in 2012). If you have never seen milonga danced, this will blow you away. The music-to-video sync is a little bit off, but you will hear the milonga clave above. Below is a Dutch Latin Jazz Band who has recognized (in part) how the clave works well with the the milonga and tango. The problem is that they often have the wrong clave for tango, adding more than the trecillo, but that's okay. Listen to this -- it's not really tango but latin-jazzed-up-tango. Jerry Rivera did a better album dedicated to Carlos Gardel, but he did not try to call it tango with clave, and he did it for dancers. Jazz musicians have long forgotten what Count Basie knew -- if it doesn't make you dance, it ain't really jazz. Tango's Clave on the upbeat! ||: *2**5**8 | *2**5**8 :|| = the up-beat Tango clave (2/5/8). ||: 1**4**7* | 1**4**7* :|| = the normal Tango clave (1/4/7). Remember that milonga was easier to hear and dance to? 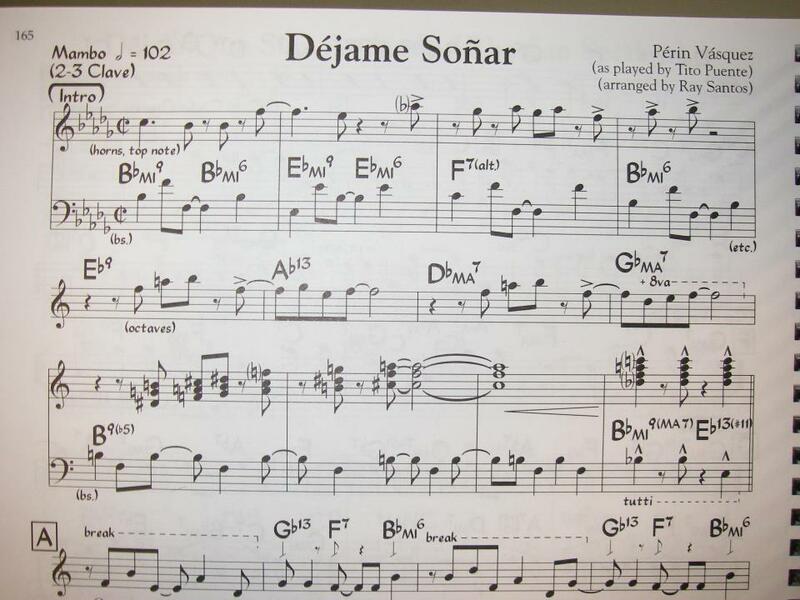 Let's compare milonga to this up-beat clave, and you can see why Di Sarli is so easy to dance to. ||: *2**5**8 | *2**5**8 :|| The "Di Sarli" clave. ||: 1**45*7* | 1**45*7* :|| The Milonga clave. I first recognized the alternative tango clave while listening to Di Sarli. I was ecstatic! Later, I started hearing it used by many great composers, like Pugliese. This clave is a spin-off from the down-beat clave, but one or the other must be used as the foundation to tango compositions. That is what makes them tangos and rumbas or mambos! This whole discussion is worthless if you di not learn to clap the clave with the music. If you didn't do that, please go back again; try to learn to clap the clave first. Start out very slowly. You must build it up slowly to a faster tempo. Then play the following Di Sarli piece. The next step is to be able to catch the clave in this typical Golden Age music with your feet. Women can catch the clave at times with ornamentos even if she is dancing with a man who is a slow-slow-quick-quick kind of guy (European pulse dancing). Nothing is wrong with dancing on the pulse, but how about the clave at times. That is what makes tango so great! As I said at the top, this page is under construction. 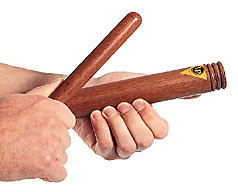 I will add more on tango and rumba claves in the future with better examples for dancers.